Got an email today stating I have saved just over 2 tonnes of CO2, I didn't realise how much of an impact Im already having. It's small victories now which will help climate change, I have now converted to nearly all vegetarian, cycle to work in the summer. Today was some really good news for myself and I hope others are similarly elated with how much they're helping the planet. Thanks for being a part of that team bulb. I dont mind helping the planet as I do think there is too much pollution but I dont buy in to the climate change aspect of it. It used to be climate cooling until the stats went the other way then it was climate warming, now it is climate change which covers them both ways. I don't mind helping the planet as I do think there is too much pollution but I don't buy in to the climate change aspect of it. 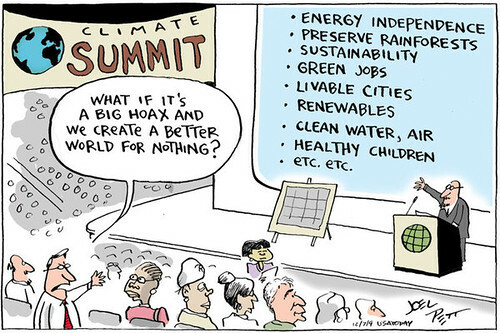 True, even if it turns out to be a hoax, it would be nice if we had a sustainable population, with very low impact on earth. With little pollution, more green spaces, and people not dying due to war / conflict /food shortages. The problem is, humans destroy natural feedback loops that every other species is limited by. Humans adapt the earth to make it comfortable to them at the expense of the planet. If the environment changes or isn't right for a plant / animal then they simply stop breeding and reduce in population, humans have a growing population problem and as the poorer nations develop not only do they have huge populations, they will have a much greater pollution impact when they do develop. Best sow the seeds of a clean future and it will snowball. I don't see how anyone can seriously believe it to be a hoax. Speaking as an academic, I must have been off sick the day they handed out the brown envelopes to convince us to fake all the data. I don't much care for the marketing greenwash in that email. It's simply not true to claim that "In 2018, 33% of the country's power came from renewables. " . It didn't: a third of electricity production is not the same as 'the country's power' and never will be, not while the biggest use of power is for transport followed by cooking/heating gas. Surely Bulb has enough it can legitimately crow about without resorting to dishonest hyperbole. People seem to think its agenda driven. I understand. My comment was in general not specific to what you had written. Sorry for the confusion. That was the image I was after. Thanks! But you haven't saved the planet 2 tonnes of CO2... For that reason I have issue with the comparison to planting trees. As has been discussed a number of times, Bulb doesn't directly increase the quantity of renewables in the UK energy mix, so as much as they might do something to improve the future mix and people's perceptions, the planet's still getting just as much CO2 from energy generation whether you're with Bulb or one of the big 6.